Assistant Director supports the Director in departmental growth and in monitoring progress. These assistants assist in developing and executing departmental goals and plans, work along with the director and supervise the daily operations, ensure compliances, monitor objective attainment, undertake hiring staffs, training and evaluating, assisting in budgeting and controlling expenditure, maintaining schedule of events, creating reports, fulfilling all the duties that are assigned by their respective directors. The essential requirements for becoming an Assistant Director is to have experience in performance and operations management, proficiency in MS Office, database and related software like ERP, knowledge of regulations and quality standards and outstanding public speaking skills. 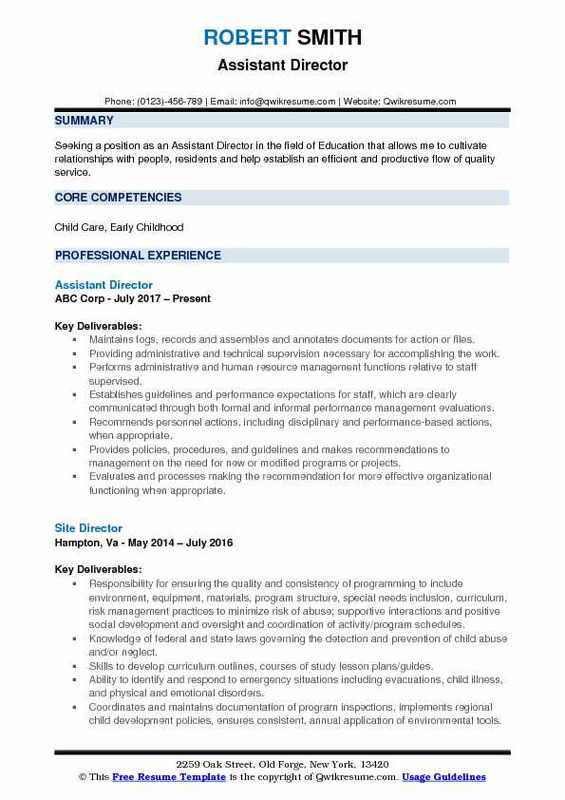 Those seeking to make a career in this line need to mention in Assistant Director Resume at least a degree in Business Administration or related field. However, a post-graduation will prove to be an asset. Summary : Versatile Assistant Director focused on team building and talent development. Driven to surpass company goals. I am self-motivated and results driven with a high energy to boost morale, empower employees and increase productivity through process verification, documentation maintenance as related to staffing, training and performance evaluations. Sharp eye for high-caliber candidates, to reach desired individual and company objective. 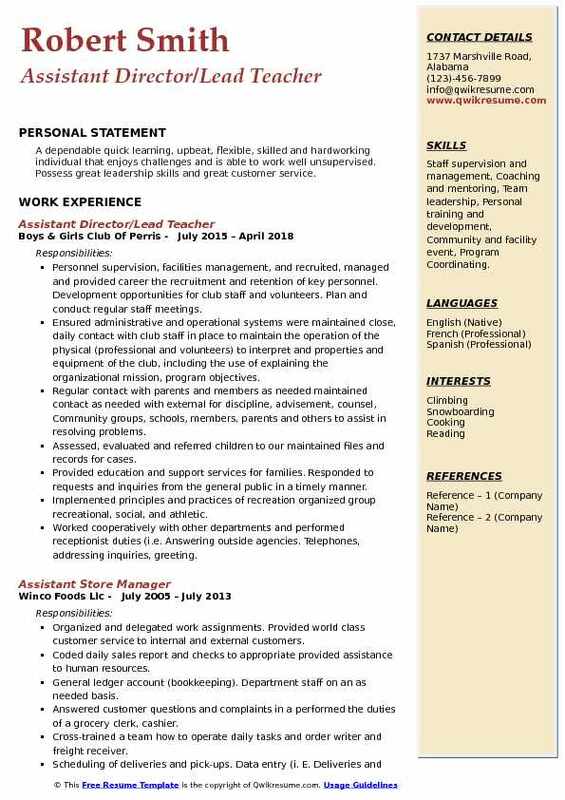 Skills : Management, Supervisor, Computers, Networking, Security, Human Resource Management. 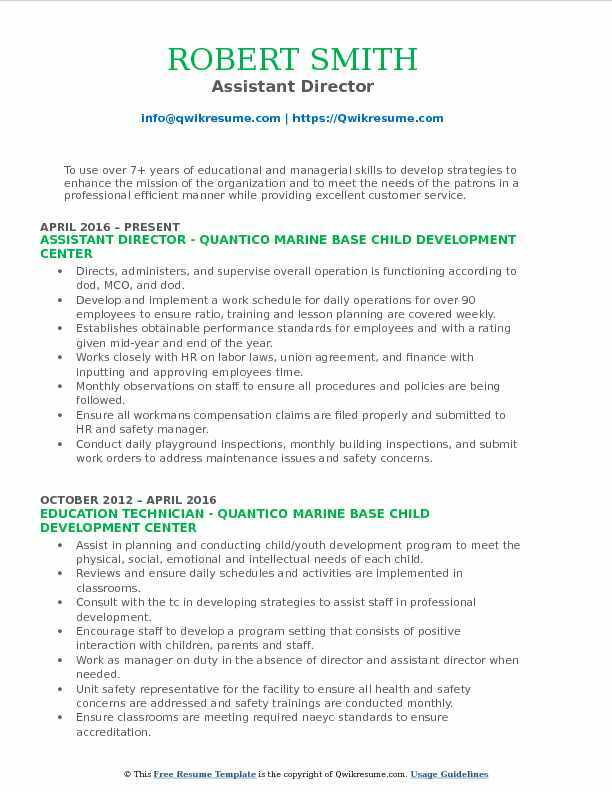 Supervise and coordinate the activities of the staff and faculty at the Oceana education center. Implement the university strategic plan and the division of continuing education plan of operation as it relates to current and future activities within the education center. Achieve university budget requirements and appropriately expend university budget resources. Represent the university to appropriate public and private constituencies, including overseeing compliance activities with various regulatory agencies such as sacs, US military, and others. Implement various university academic, fiscal, and human resources policies. Seek out new ventures and opportunities in accordance with the university strategic plan and the division of continuing education plan of operation. Advise undergraduate and graduate students on their individual academic plans and course selection. Process tuition assist forms, third-party billing, coordinate with the navy college on all matter pertaining to tuition assistance. Develop, modify and distribute excel workbooks containing current professors and courses taught. Configure new computers from images, set up user accounts. Install card necessary to complete specific functions. 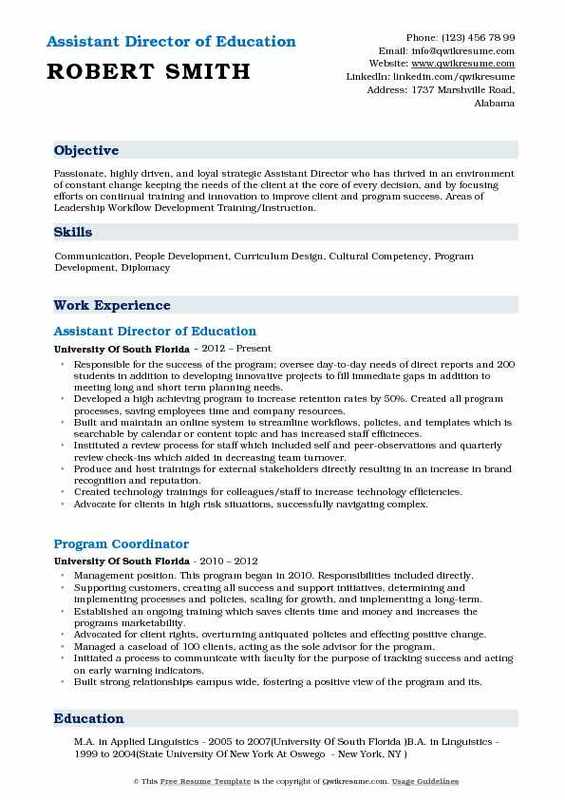 Objective : Seeking a position as an Assistant Director in the field of Education that allows me to cultivate relationships with people, residents and help establish an efficient and productive flow of quality service. Maintains logs, records and assembles and annotates documents for action or files. Providing administrative and technical supervision necessary for accomplishing the work. Performs administrative and human resource management functions relative to staff supervised. Establishes guidelines and performance expectations for staff, which are clearly communicated through both formal and informal performance management evaluations. Recommends personnel actions, including disciplinary and performance-based actions, when appropriate. Provides policies, procedures, and guidelines and makes recommendations to management on the need for new or modified programs or projects. Evaluates and processes making the recommendation for more effective organizational functioning when appropriate. Providing guidance and assistance to staff, in the performance of their duties. Resolves informal complaints and grievances and provides advice and counsel to workers related to work and administrative matters. Evaluates processes in place and making recommendations for more effective organizational functioning when appropriate. Provides clarifications of standard operating procedures upon request and when personal observations indicate that clarification may be appropriate. Reviews complaints from customers, performing fact-finding as necessary to respond to the issue or make recommendations to senior management. Summary : Highly efficient and dedicated professional with experience in social service functions, case management, community relations, client service, welfare agency relations and team leadership issues. Demonstrated ability delivering unparalleled client service, offering high-level communications, improving processes, analyzing complex issues, developing viable solutions, and managing teams. Manage and approve staff, volunteers, and other agency collaboration staff timesheet completion. Manage and support other service providers that provide direct services to bhnc participants. Articulated the organization's mission and programmatic goals to program staff, volunteers, and community partners. Conduct annual employee review and coordinators in consultation with the executive director. Oversee planning, implementation, and development of senior services program core programs, social services, congregate meal, volunteer, food banks food pantry/ food box, activities. Synchronizing program calendars and activities, and leading all program and supervision. Manage and oversee the evaluation of the senior services core programs through collaborators, Online surveys and focus groups; synthesizing and analyzing evaluation data. Oversee program outreach to educational and community institutions through scheduling. Provide direct collaboration with employment services program to assist clients in job searching. Pre-screened and tracked candidates and processed all new hires for employment and orientation. 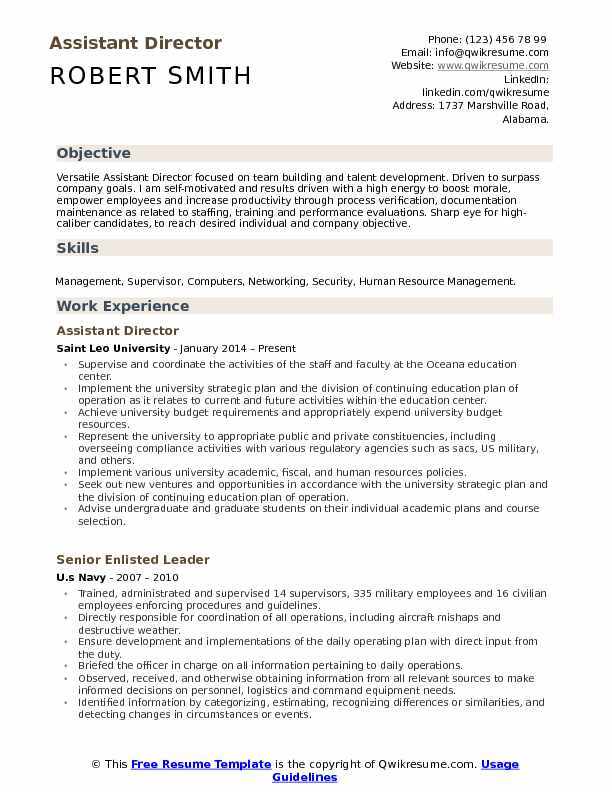 Objective : Seeking the responsibility and accountability of a challenging leadership position with an organization offering opportunities for successful career-pathing. 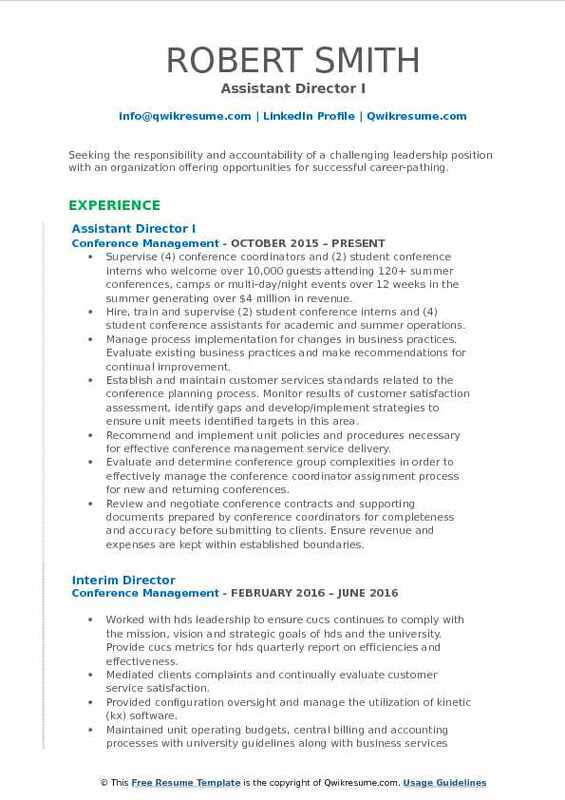 Supervise (4) conference coordinators and (2) student conference interns who welcome over 10,000 guests attending 120+ summer conferences, camps or multi-day/night events over 12 weeks in the summer generating over $4 million in revenue. Hire, train and supervise (2) student conference interns and (4) student conference assistants for academic and summer operations. Manage process implementation for changes in business practices. Evaluate existing business practices and make recommendations for continual improvement. Establish and maintain customer services standards related to the conference planning process. Monitor results of customer satisfaction assessment, identify gaps and develop/implement strategies to ensure unit meets identified targets in this area. Recommend and implement unit policies and procedures necessary for effective conference management service delivery. Evaluate and determine conference group complexities in order to effectively manage the conference coordinator assignment process for new and returning conferences. Review and negotiate conference contracts and supporting documents prepared by conference coordinators for completeness and accuracy before submitting to clients. Ensure revenue and expenses are kept within established boundaries. 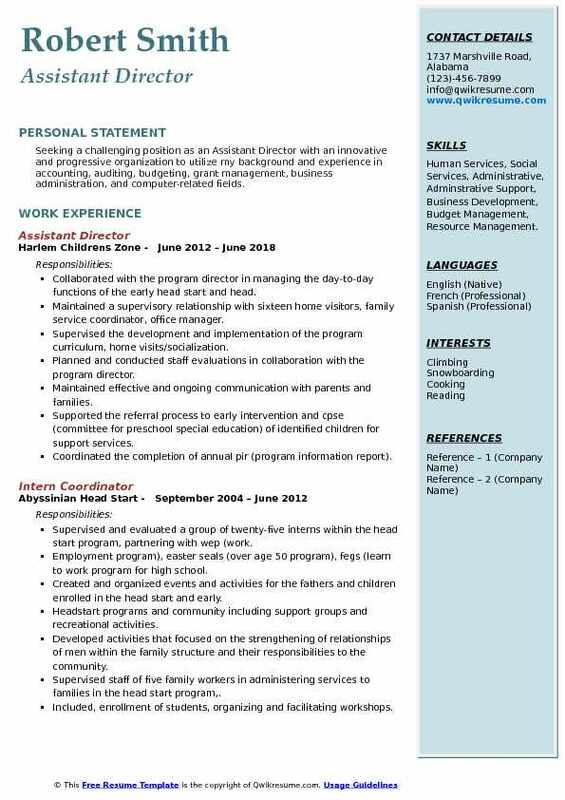 Summary : Seeking a challenging position as an Assistant Director with an innovative and progressive organization to utilize my background and experience in accounting, auditing, budgeting, grant management, business administration, and computer-related fields. Skills : Human Services, Social Services, Administrative, Adminstrative Support, Business Development, Budget Management, Resource Management. Collaborated with the program director in managing the day-to-day functions of the early head start and head. Maintained a supervisory relationship with sixteen home visitors, family service coordinator, office manager. Supervised the development and implementation of the program curriculum, home visits/socialization. Planned and conducted staff evaluations in collaboration with the program director. Maintained effective and ongoing communication with parents and families. Supported the referral process to early intervention and cpse (committee for preschool special education) of identified children for support services. Coordinated the completion of annual pir (program information report). Created and organized events and activities for the fathers and children enrolled in the head start and early. Headstart programs and community including support groups and recreational activities. Developed activities that focused on the strengthening of relationships of men within the family structure and their responsibilities to the community. Supervised direct service staff including three family workers and support staff in providing comprehensive. Monitored and strengthened family support services, managed crises families, formed community. Summary : Passionate, highly driven, and loyal strategic Assistant Director who has thrived in an environment of constant change keeping the needs of the client at the core of every decision, and by focusing efforts on continual training and innovation to improve client and program success. Areas of Leadership Workflow Development Training/Instruction. Responsible for the success of the program; oversee day-to-day needs of direct reports and 200 students in addition to developing innovative projects to fill immediate gaps in addition to meeting long and short term planning needs. Developed a high achieving program to increase retention rates by 50%. Created all program processes, saving employees time and company resources. Built and maintain an online system to streamline workflows, policies, and templates which is searchable by calendar or content topic and has increased staff efficineces. Instituted a review process for staff which included self and peer-observations and quarterly review check-ins which aided in decreasing team turnover. Produce and host trainings for external stakeholders directly resulting in an increase in brand recognition and reputation. Created technology trainings for colleagues/staff to increase technology efficiencies. Advocate for clients in high risk situations, successfully navigating complex. Spearheaded the implementation of a client tracking program which has increased efficiencies and reduced labor costs. Headline : To use over 7+ years of educational and managerial skills to develop strategies to enhance the mission of the organization and to meet the needs of the patrons in a professional efficient manner while providing excellent customer service. Directs, administers, and supervise overall operation is functioning according to dod, MCO, and dod. Develop and implement a work schedule for daily operations for over 90 employees to ensure ratio, training and lesson planning are covered weekly. Establishes obtainable performance standards for employees and with a rating given mid-year and end of the year. Works closely with HR on labor laws, union agreement, and finance with inputting and approving employees time. Monthly observations on staff to ensure all procedures and policies are being followed. Ensure all workman's compensation claims are filed properly and submitted to HR and safety manager. Conduct daily playground inspections, monthly building inspections, and submit work orders to address maintenance issues and safety concerns. Models appropriate behaviors and techniques for program assistants and leads that promotes positive interactions with children, parents, and vendors. Work with training and curriculum specialist to identify training needs for staff. Conduct yearly and quarterly evaluations of staff to ensure that set goals are being met by doing monthly observations of the staff. 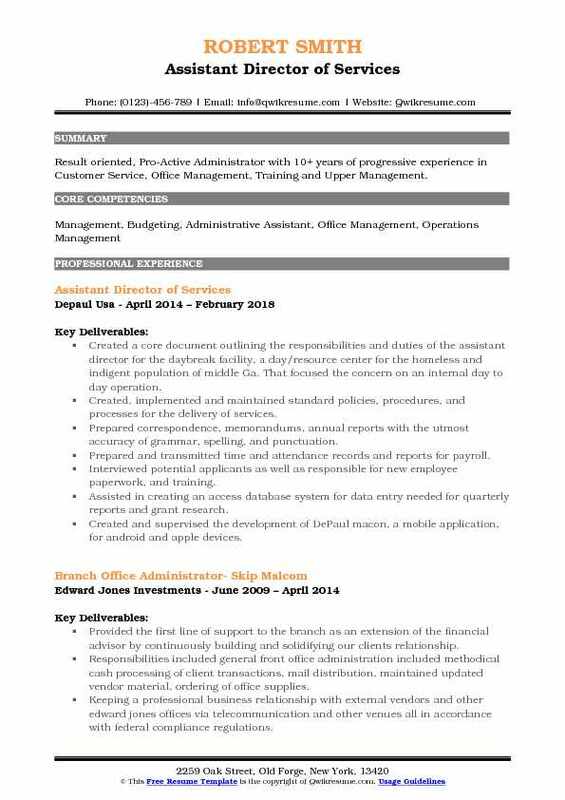 Summary : Result oriented, Pro-Active Administrator with 10+ years of progressive experience in Customer Service, Office Management, Training and Upper Management. Created a core document outlining the responsibilities and duties of the assistant director for the daybreak facility, a day/resource center for the homeless and indigent population of middle Ga. That focused the concern on an internal day to day operation. Created, implemented and maintained standard policies, procedures, and processes for the delivery of services. Prepared correspondence, memorandums, annual reports with the utmost accuracy of grammar, spelling, and punctuation. Prepared and transmitted time and attendance records and reports for payroll. Interviewed potential applicants as well as responsible for new employee paperwork, and training. Assisted in creating an access database system for data entry needed for quarterly reports and grant research. Created and supervised the development of DePaul macon, a mobile application, for android and apple devices. Efficient management of operating budget, including keeping track of staff expenditures, research, conservative purchases and keeping finance director informed, allowed us to carry over a positive balance every year. Managed and supervised the volunteer coordinator, custodian and community service members. Improved the organization of, maintenance of and current review of all program files for accuracy as required for the city development and block grant issued by the state of Ga.
Ensured that all daybreak policies and procedures were being adhered to, particularly those relating to health and safety, code of practice and confidentiality. Summary : A dependable quick learning, upbeat, flexible, skilled and hardworking individual that enjoys challenges and is able to work well unsupervised. Possess great leadership skills and great customer service. 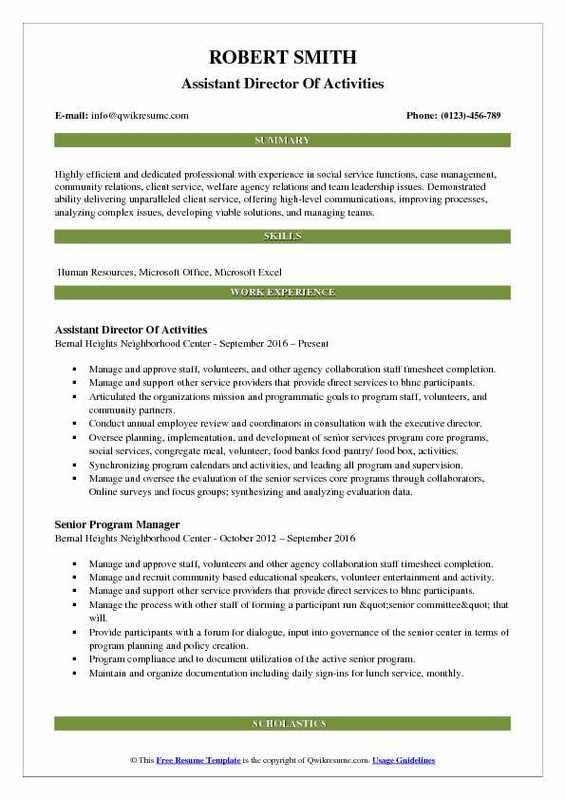 Skills : Staff supervision and management, Coaching and mentoring, Team leadership, Personal training and development, Community and facility event, Program Coordinating. Personnel supervision, facilities management, and recruited, managed and provided career the recruitment and retention of key personnel. Development opportunities for club staff and volunteers. Plan and conduct regular staff meetings. Ensured administrative and operational systems were maintained close, daily contact with club staff in place to maintain the operation of the physical (professional and volunteers) to interpret and properties and equipment of the club, including the use of explaining the organizational mission, program objectives. Regular contact with parents and members as needed maintained contact as needed with external for discipline, advisement, counsel, Community groups, schools, members, parents and others to assist in resolving problems. Assessed, evaluated and referred children to our maintained files and records for cases. Provided education and support services for families. Responded to requests and inquiries from the general public in a timely manner. Implemented principles and practices of recreation organized group recreational, social, and athletic. Worked cooperatively with other departments and performed receptionist duties (i.e. Answering outside agencies. Telephones, addressing inquiries, greeting. Assisted customers with applications and other child supervision and activity coordinating ages 5. Conducted timesheet entry and distribution of consistently met or exceeded timelines and payroll checks to staff members. Prioritizing workflow processes, Electronic/paper record keeping and file responsible for submitting grant reports, invoices. 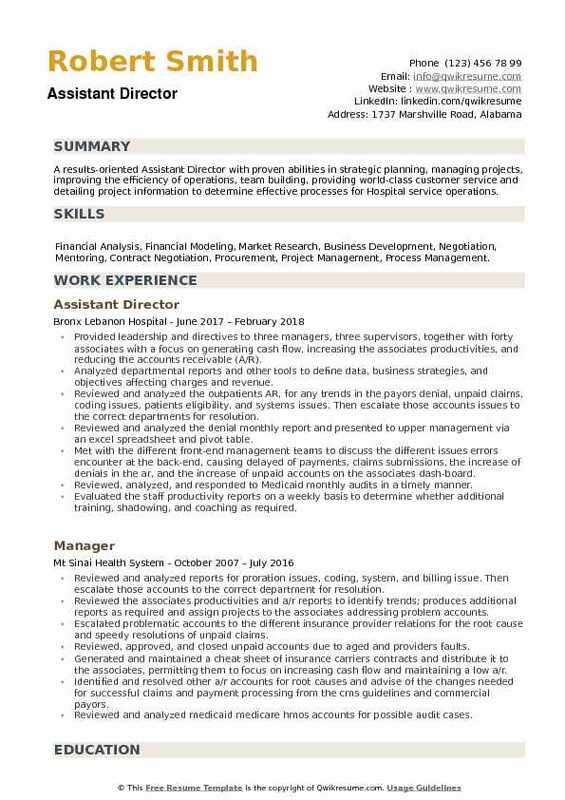 Summary : A results-oriented Assistant Director with proven abilities in strategic planning, managing projects, improving the efficiency of operations, team building, providing world-class customer service and detailing project information to determine effective processes for Hospital service operations. Skills : Financial Analysis, Financial Modeling, Market Research, Business Development, Negotiation, Mentoring, Contract Negotiation, Procurement, Project Management, Process Management. Provided leadership and directives to three managers, three supervisors, together with forty associates with a focus on generating cash flow, increasing the associate's productivities, and reducing the accounts receivable (A/R). Analyzed departmental reports and other tools to define data, business strategies, and objectives affecting charges and revenue. Reviewed and analyzed the outpatient's AR, for any trends in the payors denial, unpaid claims, coding issues, patients eligibility, and systems issues. Then escalate those accounts issues to the correct departments for resolution. Reviewed and analyzed the denial monthly report and presented to upper management via an excel spreadsheet and pivot table. Met with the different front-end management teams to discuss the different issues errors encounter at the back-end, causing delayed of payments, claims submissions, the increase of denials in the ar, and the increase of unpaid accounts on the associates dash-board. Reviewed, analyzed, and responded to Medicaid monthly audits in a timely manner. Evaluated the staff productivity reports on a weekly basis to determine whether additional training, shadowing, and coaching as required. Created and developed training documents to assist the associates in their daily activates.